Barely a week old and players are already winning left, right and center with our hottest new game… Samba Sunset. Ask Joseph L. from Virginia who took it for a spin and won $5,360.60. Or Timothy S. from Pennsylvania who was playing on his cell and won $6,660.70. Two Californians, Patricia P. and Matt L., no strangers to hot sunsets themselves, also won big hitting $11,855.40 and $11,912.75 respectively. Christina T. hailing from Superman’s home state of Kentucky hit $28,508.15 playing on her phone. She doesn’t mind roaming charges anymore. 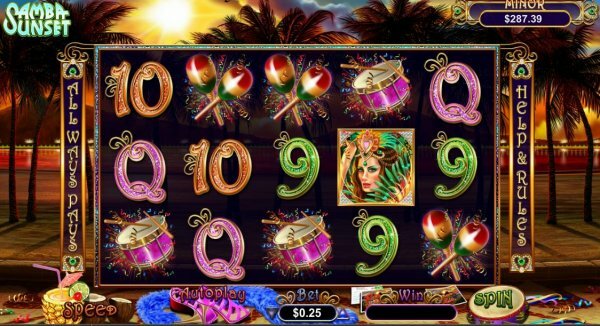 All winners on Samba Sunset. Oldie but goodie, Caesar’s Empire, bestowed a fat payday to Julie H. who hit 5 Cleopatra symbols netting her $37,500. No wonder it’s a player favorite. Since Caesar’s Empire is this week’s Every Day 14 Spins* game, go after the jackpot on us right now.